grunt gallery Program Director Glenn Alteen is Retiring! Program Director Glenn Alteen has worked with grunt since its inception in 1984 and in May of 2020 will retire after 36 years in the position. In early 2018 the board and staff of the gallery began activating our Succession Plan designed to provide as little disruption to the organization as possible during the transition of Program Directors. Our informed and active Succession Committee consisting of current and former board members and staff were tasked with addressing hiring in relation to leadership succession. After extensive work, the Committee has unrolled a timeline and hiring process for the transition. The Committee continues to refine this process on an ongoing basis and will address any succession planning issues as they arise. A year-long transition period is being planned for the new Program Director in order to provide a seamless changeover and to download grunt’s programming and funding processes and allow for introductions to long-term artists, supporters and funders. grunt incorporated a Management Transition Reserve Fund into annual budgets since 2016 to facilitate this transition. 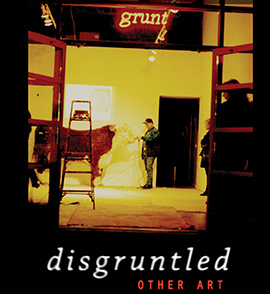 Formed in 1984, grunt gallery has built a reputation on innovative and dynamic programming: exhibitions, performances, artist talks, publications and special projects that showcase work by contemporary Canadian and international artists. grunt focuses on work and artists that would otherwise not be seen in Vancouver. We are proud of our ability to act as an intersection between various cultural groups based on aesthetics, medium or identity. With emerging programs such as the Blue Cabin Residency and the Mount Pleasant Community Art Screen grunt is expanding and developing its range, providing artists with new and exciting opportunities and audiences with unique and important experiences. The Program Director job call will be released on Friday, January 18, 2019. You can access information from grunt gallery’s website grunt.ca and follow grunt gallery news through our monthly newsletter and social media channels: Facebook, Twitter and Instagram.